Time, day, and date Place/venue and address Website and phone number Brief description of events Tickets? Yes or no. How much? All submissions are welcome, however, events are included in Pasa Week as space allows. El Zaguán 545 Canyon Rd., 505-983-2567. Alignment, mixed-media installation by Carolyn Riman, reception 5-8 p.m., through May 4. Center for Contemporary Arts 1050 Old Pecos Trail, 505-982-1338. The Armory Show, multimedia group exhibit and program series in celebration of CCA’s 35th anniversary, through May 30, Muñoz Waxman Gallery (See story, Page 32); Enveloping Space: Walk, Trace, Think, Jane Lackey’s site-specific installation, through May 30, Spector-Ripps Project Space; reception 6-8 p.m. (See story, Page 36) Museum of Contemporary Native Arts 108 Cathedral Place, 505-983-1777. BFA Student Exhibit, showcase of contemporary and traditional works, through May 18. New Concept Gallery 610-A Canyon Rd., 505-795-7570. Santa Fe in Bloom, botanical-themed works by Carole Aine Langrall, Richard Solomon, and Brian Arthur, reception 5-7 p.m., through May 11. SITE Santa Fe 1606 Paseo de Peralta, 505-989-1199. SITE Unseen 8, group show and fundraiser; ticketed preview 5-6 p.m. $100; free public opening follows, through Sunday. Than Povi Fine Art Gallery 6 Banana Lane, 10 miles north of Santa Fe off US 84/285, 505-455-9988. 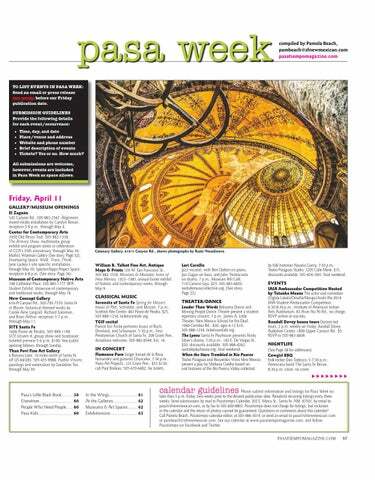 Pueblo Visions, paintings and watercolors by Geraldine Tso, through May 30. Catenary Gallery, 616 ½ Canyon Rd., shows photographs by Rumi Vesselinova. William R. Talbot Fine Art, Antique Maps & Prints 129 W. San Francisco St., 505-982-1559. Missions & Moradas: Icons of New Mexico, 1925–1985, annual Easter exhibit of historic and contemporary works, through May 9. 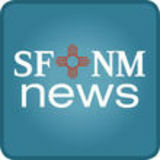 Serenata of Santa Fe Spring for Mozart, music of Pärt, Schnittke, and Mozart, 7 p.m., Scottish Rite Center, 463 Paseo de Peralta, $25, 505-988-1234, ticketssantafe.org. TGIF recital Pianist Eric Fricke performs music of Bach, Dowland, and Schumann, 5:30 p.m., First Presbyterian Church of Santa Fe, 208 Grant Ave., donations welcome, 505-982-8544, Ext. 16. Flamenco Puro Singer Ismael de la Rosa Fernandez and guitarist Chuscales, 7:30 p.m., Yares Art Projects, 123 Grant Ave., $55-$150, call Paul Boileau, 505-670-6482, for tickets. by folk historian Nasario García, 7:30 p.m., Teatro Paraguas Studio, 3205 Calle Marie, $15, discounts available, 505-424-1601, final weekend. IAIA Ambassador Competition Hosted by Tatanka Means The actor and comedian (Oglala Lakota/Omaha/Navajo) hosts the 2014 IAIA Student Ambassador Competition, 6:30-8:30 p.m., Institute of American Indian Arts Auditorium, 83 Avan Nu Po Rd., no charge, RSVP online at iaia.edu. Randall Davey house tours Docent-led tours, 2 p.m. weekly on Friday, Randall Davey Audubon Center, 1800 Upper Canyon Rd., $5, RSVP to 505-983-4609.